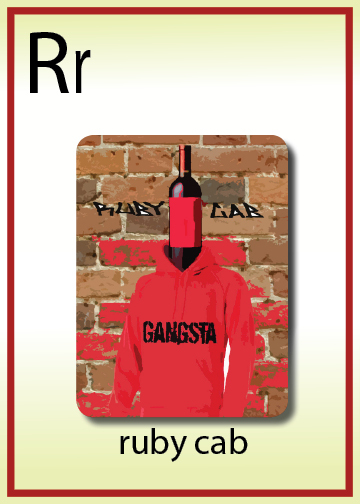 You can say Ruby Cab is “old school”, “keepin’ it real”. Ruby Cab is not frontin’. Ruby Cab is straight up gangsta. I don’t mean Marky Mark gangsta and it’s not NWA gangsta. Ruby Cab is back in the day gangsta, like the Fonz. Ruby Cab is interracial. It is a cross between Cabernet Sauvignon and Carignan, also known as the Olmo grape. A name taken from it’s creator Dr. Harold Olmo of UC Davis. Ruby Cab was the link to the masses. Ruby Cab was resistant to the 5.0, the heat. It had a real hustle, it toned down the tannins of Cabernet while retaining its fruitiness. It was perfect for giving the hooky hooks to bulk wines. “You know it’s hard out here for a pimp”, my boy had to watch his back. Ruby Cab was susceptible to powdery mildew and leaf viruses. Even up against the wall, he found his way out of the projects of the San Joaquin & Napa Valleys. Today it is grown in Chile, Argentina, South Africa and other ghetto’s like Australia. If you ever get a chance to try Ruby Cab, enjoy it for what it is and pour one out for your dead homies. but this gangsta is old skool. He’s like straight of Grease not Compton.